The ID Tech OmniXpress has been discontinued. No direct replacement is available. The IDTech OmniXpress is designed for POS applications and is ideal where a single reader is needed to provide both magnetic stripe and contactless operation. For example, there are many applications in quick-service venues and self-service kiosks. The unit can be mounted on a wall or counter top. 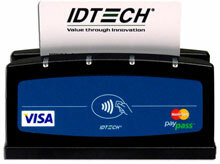 Clear visibility of the LED panel on top of the device makes it easy for cardholders to see they have completed a successful card read operation. The OmniXpress is designed to withstand daily use and in unattended applications. The rugged design provides protection from vandalism and allows for reliable, weather-resistant operation. The housing is constructed with a sturdy base, an impact-resistant cover, and a stainless steel card slot wear plate.